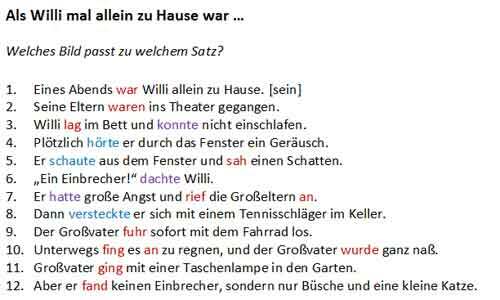 Here is an activity I use to teach the German simple past tense inductively. Students are already familiar with the perfect tense, and they have begun practicing the simple past forms of haben, sein, and the modal verbs (though this prior experience with the simple past isn’t absolutely necessary). The story and sentences come from the first-year German textbook Kontakte. First, I make copies of the pictures in the story and cut them into sets of twelve squares. Then I print copies of the text of the picture story in order. Each student gets a set of picture cut-outs and the page with the sentences. Or they can work in pairs. The students then go to work matching each picture with the correct sentence. As they are finishing this activity, I tell students to read through each sentence again and underline the verbs and guess what the verb infinitive is. Some of the verb forms will be recognizable to students. Even if they don’t recognize the forms (e.g. lag, rief, fuhr), I remind them that they know where in German sentences to look for verbs, namely in the second position and at the end of a sentence. When students are finished with these two activities, using an overhead or a data projector, I show the students the complete, ordered picture story so they can self-check if they arranged the pictures in the right order. Then I put up the sentences and we go through them one by one. As students name the verbs and infinitives, I underline (on the overhead) or color code (on the data projector) each verb, without remarking on my color choice. And I write the infinitive at the end of each sentence. Sometimes they need clues, and I point them back to the photos which often help them guess the verbs. While looking at the simple past tense paradigm, I ask students: What is an infinitive stem and how can you find it? Students usually know that it is the infinitive minus -en/-n. How can you know what the changed stem of a mixed or strong verb is? Students figure out from their experience with the perfect tense that they need to look these up. Where can you look these up? I may have to point out that the simple past form in the principle parts is given in the third person singular (er/sie/es) form. Once students are familiar with the German simple past as a form, we talk about usage. What is the difference between the simple past and the perfect tense in German? After all, up to this point they have been able to talk about events in the past without knowing the simple past tense. So what is it for? • The SIMPLE PAST TENSE is a narrative past tense, as it is used, for example, in the Bildgeschichte. It is most often used in written accounts of past events. The PERFECT, by contrast, is a conversational past tense. • The SIMPLE PAST refers to completed past action only. The PERFECT tense can convey varied aspect with respect to time. • However, the SIMPLE PAST forms of sein, haben, and the modal verbs are frequently used alongside the PERFECT in conversation. SIMPLE PAST forms of the verbs werden, wissen, and a handful of other commonly used verbs are sometimes heard in spoken German. • Therefore, beginning and intermediate students ought to first master the PERFECT tense and be able to produce the SIMPLE PAST forms of the common verbs. They only need to recognize (and not produce) most other verbs in the SIMPLE PAST. • The second person (du/ihr) forms of the SIMPLE PAST, particularly for strong verbs, are only very rarely used or heard. Finally, ome students notice (or if they do not, I point out) that sentence #2 contains both the simple past form of sein AND a past participle at the end of the sentence. I use the opportunity to briefly introduce the past perfect tense and to show them the difference between the present perfect (which uses the present tense of the helping verb plus past participle, hence “present perfect”) and past perfect (which uses the simple past tense of the helping verb plus the past participle, thus “past perfect”). At the bottom of the Summary explanation is another short activity for the linguistics enthusiasts in your class showing how German and English verbs are similar. If you have other ideas for using these materials or for teaching the simple past, feel free to share them in the Comments below. Very interesting. I teach German and I like your material. Great idea.. I teach German and this has helped. Fantastic! My students loved it!! I’m glad it worked for you. :) Thank you for the feedback!